With the recent discovery of the elongated skulls in Peru and the debate that came along after the DNA analysis report revealed that the skulls were not human beings. It got me thinking (yes, I do that a lot) it brings me to the concept of giants. Artifacts of giant animals that we call dinosaurs have been discovered. These types of artifacts have been authenticated by the science of paleontology, whatever method paleontology used gives legitimacy to the artifacts that was discovered. 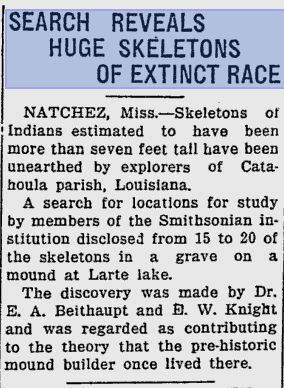 Yet, when burial mounds are unearthed and the skeleton remains of the person that was buried reveals it to be larger than a normal human being the discovery is scrutinized more than fossilized artifacts of animals and the paleontology findings are not published (at least I can’t find any). Is it a hard thing to consider the possibilities that the dinosaur was not the only giants that once roamed the earth? There is plenty of evidence that suggest it. 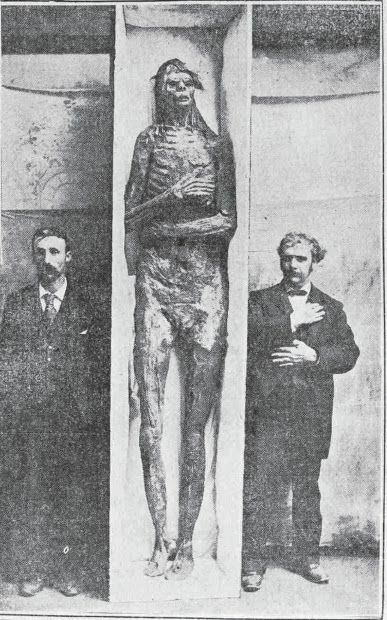 In general these types of artifacts that reveal humanoid giants are called “Out Of Place (OOP).” They are called this because the artifacts do not meet the standards of evolutionary theory. The discoveries do not conform to what is being taught. 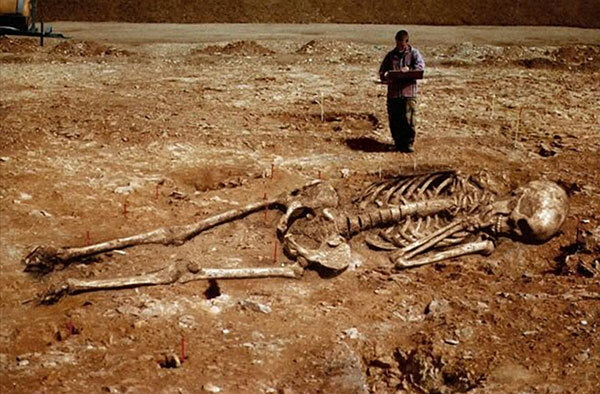 There are many unanswered questions concerning the origins these giants; at least as far as science is concerned. As a result the artifacts are put behind closed doors in the basement of the Smithsonian. So the OOP artifacts are too advanced for the state that humans were in for the time period that the OOP artifacts were said to be from. Since science cannot explain the origins there are two other theories to consider. The first one may be farfetched in the eyes of many people. Yet, in the eyes of many others it may hold water if you go by faith. It is said that the giants were called the Nephilim who were the off spring of fallen angels called the Watchers and human women. Who the Watchers were and the role that they played is explained in the BOOK OF ENOCH. The BOOK OF ENOCH. is a compilation of several separate works, most of which are apocalyptic. Its oldest portion is the “Apocalypse of Weeks,” written shortly before the Maccabean uprising of 167 bc against the Seleucids. Other sections, especially those dealing with astronomical and cosmological speculations, are difficult to date. Because of its views on messianism, celibacy, and the fate of the soul after death, parts of Enoch may have originated with or been influenced by the Essene community of Jews at Qumrān. No fragments of the longest portion of the work (chapters 37–71), were found among the Qumrān writings. This has led scholars to theorize that this section was perhaps written in the 2nd century ad by a Jewish Christian who wished to imbue his own eschatological speculations with the authority of Enoch, and added his work to four older apocryphal Enoch writings. The other theory is that the watchers were extraterrestrials who were watching over the earth when a rogue group of Watchers decided to live a carnal life. Once on earth, they mated with human women and the off spring that was produced were the giants. The authorities over the watchers were not pleased because it violated their laws. As a result the authorities did whatever they had to do to enforce their laws and eradicated the off spring of the rogue Watchers and the human females. To me the concept of extraterrestrials makes more sense. But it is just speculation on my part.